The .info domain extension is very popular. It's universally recognized and easy to remember, making it a great alternative to .com or .co. There's a good chance that anyone seeking credible information will do a .info search. What’s more, if you care about getting search engine traffic, then think of the benefits of having a keyword focused domain name as part of your overall SEO strategy. The .info top level domain isn’t like the other thousands of TLDs on the market. This trailblazing domain name was one of the first alternatives to .com. 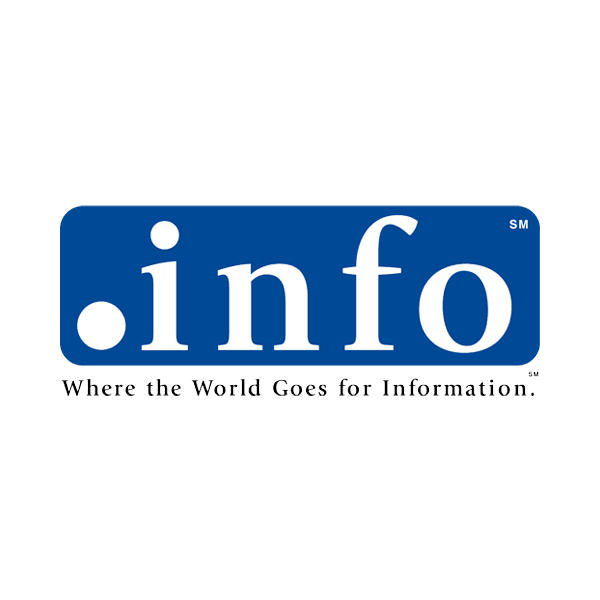 The .info domain extension came to being after ICANN released seven new generic top level domains (gTLDs). This momentous event was the first wave of new TLDs since the domain name system was developed in the 1980s. Of that initial release of seven new domain extensions, .info has been one of the most successful, even with the current availability of hundreds of other options. Who uses the .info domain? Although the .info domain extension was originally intended for informative websites, its use soon broadened to include many other uses. It can be used freely as an alternative to .com and the remaining registered gTLDs. Internet users are drawn to domain names they can understand and remember. The .info domain extension is a perfect example of this type of domain. Spread the word about your service, cause, product, or anything else that takes your fancy. There’s no better way than with your own .info TLD. Given the popularity of the .info TLD, we’d encourage anyone to snap a .info domain up quick. Secure yours today, with affordable registration from Namecheap. Every domain registered through Namecheap comes with these valuable free extras: Whois protection, email forwarding, page parking, advanced security, reliable DNS servers and more.